It is disappointing by all means that the so-called Northern Alliance - Burma (NA-B), involving the Kachin Independence Army (KIA), Kokang or Myanmar National Alliance Army (MNDAA), Ta'ang National Liberation Army (TNLA) and the Arakan Army (AA), that have not been part of the Nationwide Ceasefire Agreement (NCA), launching an offensive in northern Shan State, closed to the Chinese border. But there is a question to be asked as to why the NCA non-signatories have taken such as drastic action? The answer to this is two folds. One is the NA-B couldn't take it longer to be just a "sitting duck", shot by the Tatmadaw (Burma Army) at its will and having only to be on the "receiving end" and the other, the need to employ the military strategy of "the best defensive is the offensive”, as Hkun Okker, patron of the Pa-O National Liberation Organization (PNLO), an NCA signatory, just commented lately. Perhaps, besides, as the NA-B has said in its joint statement the need to push the Tatmadaw to rethink its "negotiated surrender" demand on the ethnic armed groups that are still yet to sign the NCA. In other words, it is like telling that excluding them from the peace process won't work. The KIA, the strongest of the NA-B has already issued a statement that this is just a "limited war" and is in no way interested to bring more burden to the civilian and promoting disintegration of national unity. This would mean that the NA-B purpose is to show that it is a force to reckon with and without them, the peace process would just come to naught. The most important recent message from State Counselor Aung San Suu Kyi writes: " In order to immediately end the armed conflicts in the northeast Shan State I strongly urged the armed groups to join the Government’s peace process, by signing the NCA, working together with the civil society to find ways and means to strengthen the monitoring towards peace goals that are aspired by the people and to join hand with all relevant stakeholders to take part on equal terms in the 21st Century Panglong Conference that is to be held in February of 2017." No doubt, the NA-B, including all other ethnic armed organizations are for signing the NCA and proceed with the nationwide political dialogue to reach national reconciliation and peaceful harmony for the whole country. But since the signing of NCA one year ago, the armed clashes with the Restoration Council of Shan State (RCSS), an NCA signatory; intruding into the Karen National Union (KNU), also an NCA signatory, territories, making use of the Karen Border Guard Force; unleashing military offensives on the KIA, even a deescalation of armed conflict was signed a few years ago between the Tatmadaw and the KIA, apart from going after the non-signatory of NCA ethnic armies like TNLA, MNDAA and AA in Shan State, have happened. In order to avoid such happenings, the UNFC, a seven ethnic armies alliance, tabled an eight point proposal to be considered so that they all could sign the NCA without having to fear the possible backlash of going back to war again. They just don't want the present situation of "talking and fighting". 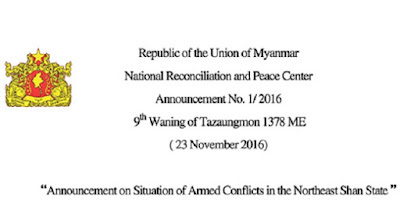 The UNFC proposal in a nutshell is the bilateral nationwide ceasefire declaration between the Tatmadaw and the ethnic armies; all-inclusiveness of all ethnic armies in the peace process; tripartite dialogue composition in all levels of peace process, as decades-long endorsed by the UN; and finally the real commitment of building a genuine federal union. And if the said conditions could be agreed upon, Suu Kyi could rest assured that all ethnic armies would flock to Naypyitaw, without even having to pressure them, to sign the NCA.